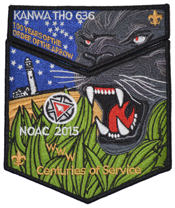 Kanwa tho Lodge has created three versions of the patch sets for the 2015 National Order of the Arrow Conference (NOAC). 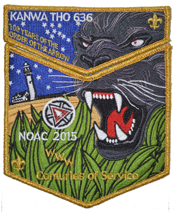 Click here for the official 2015 NOAC Patch Set order form. The general fundraiser set features a fully-embroidered patch with a black border. 1000 sets have been produced. The fundraiser set features gold mylar for the border, text, and fleur-de-lis, and red mylar for the Centennial totem and the panther's pupils. 300 sets have been produced. Limit 10 per customer. The delegate set features red mylar thread for the border, Centennial totem, and panther's pupils, and glow-in-the-dark thread in place of all of the white thread except for the lighthouse. 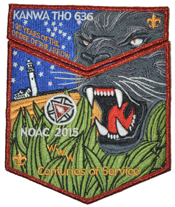 This set is only available to NOAC contingent delegates or NOAC staff members from Kanwa tho Lodge. 350 sets have been created.